These easy, Cheesy Scalloped Potatoes are about to become a new go-to side for holiday entertaining! Creamy, just the right amount of cheese, lightened up, and baked to perfection! 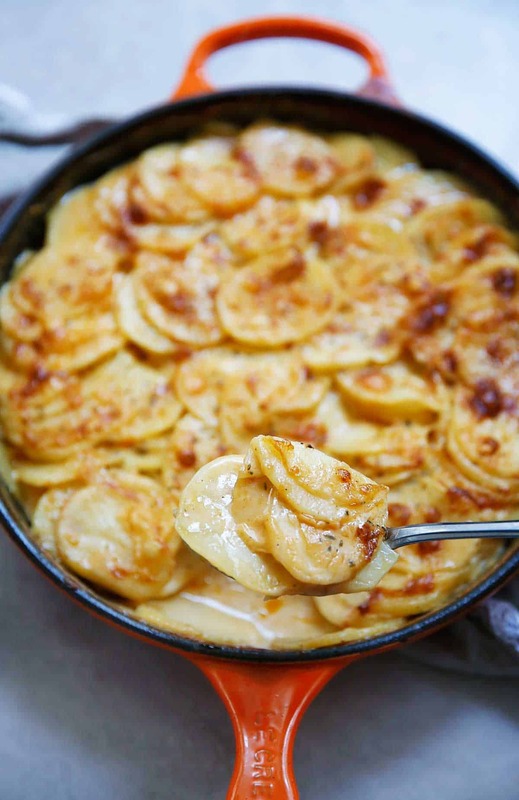 My holiday meals will be complete with this creamy au gratin scalloped potato recipe. 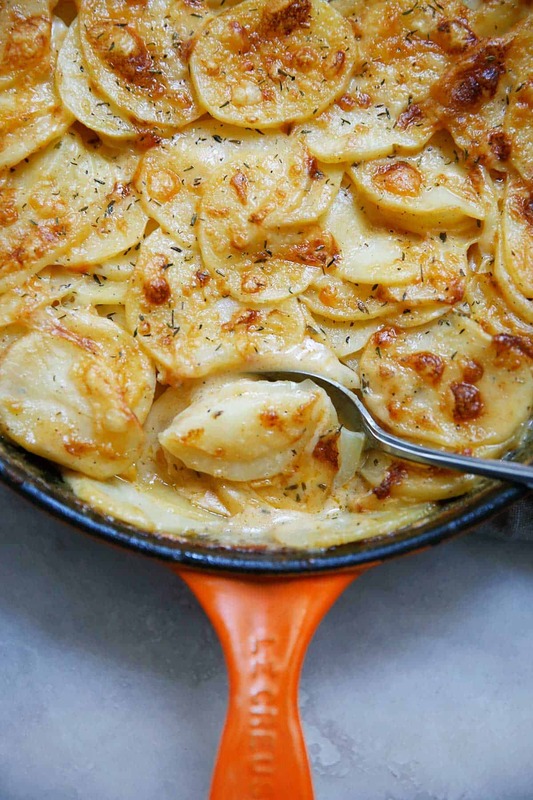 Have you ever have scalloped potatoes? 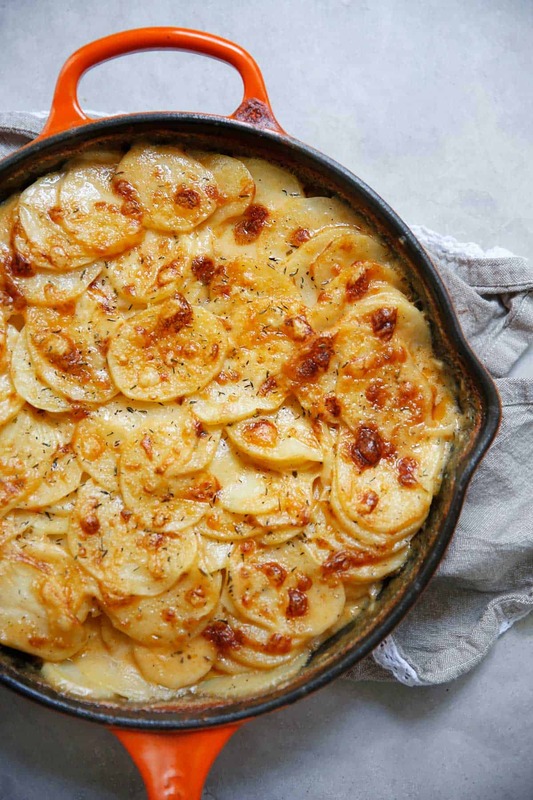 They are made with thinly sliced potatoes (this is the mandolin we recommend), an epic cheese sauce, and then baked to a crispy-topped perfection. So much flavor! This lightened up version is easy to make and so delicious. This is a holiday must-make this year and for years to come. It will definitely be on our table! Grab my other healthy and gluten-free Thanksgiving recipes! Pre-heat the oven to 400°F. Grease an 8" casserole dish with butter and set aside. In a dutch oven or large saucepan, melt 1 tablespoon of butter over medium heat. Add onion and cook until onion is translucent and starting to soften, about 5 minutes. Add remaining tablespoon of butter, salt and pepper, all spices and arrowroot then stir until melted and combined. Slowly whisk in almond milk, a half cup at a time until completely combined. Increase heat to medium and cook for 10 minutes, stirring occasionally until the sauce has darkened in color and thickened. Remove from the heat and stir in the 1-3/4 cups cheddar cheese until melted. Add sliced potatoes and mix to combine. Pour in the casserole dish, and smooth down. Top with remaining cheddar cheese and bake for 40 minutes uncovered, until the potatoes are cooked through and a knife can easily be inserted. Top with herbs of choice: thyme, scallions, parsley and serve warm! Oh man do these look so creamy and delicious! 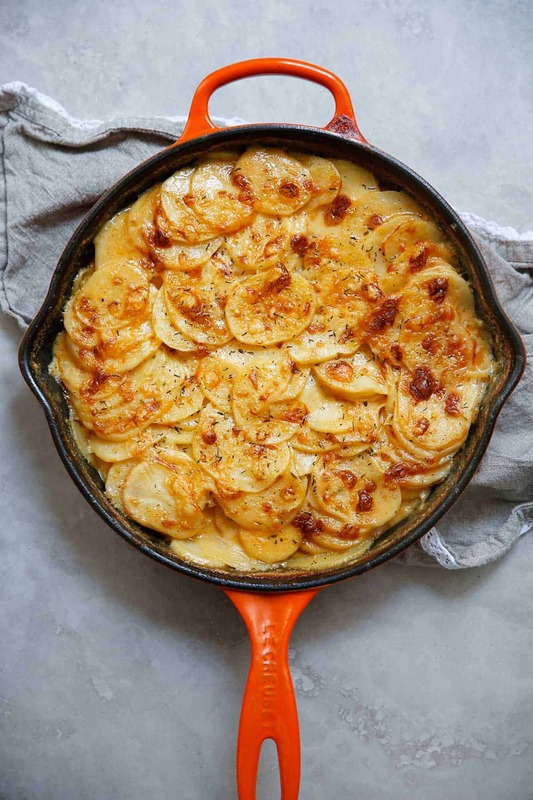 Scalloped potatoes are a MUST! Oooohhh yes!! these are perfect beside a nice pink filet!! This looks so delicious! Love this lightened up version. These look so absolutely wonderful Lexi!! the perfect Holiday side dish! What is dairy-free milk? Can I use almond milk? What kind and brand of dairy free milk and cheese did you use?! This looks amazing!!! I use good quality cheddar and Pacific Foods almond milk! Never met a potato side dish I didn’t like! Do you think I can make this the night before and do the baking part the next day? Yes, I’d slice potatoes + make sauce and then put together and bake the next day. Is there ANY possible way this would work with dairy free cheese? Sure – you can try any vegan cheese you like, though we haven’t tested it with any!